M. Night Shyamalan brings together the narratives of two of his standout originals—2000’s Unbreakable and 2016’s Split, in one explosive, all-new comic-book thriller: Glass. From Unbreakable, Bruce Willis returns as David Dunn as does Samuel L. Jackson as Elijah Price, known also by his pseudonym Mr. Glass. Joining from Split are James McAvoy, reprising his role as Kevin Wendell Crumb and the multiple identities who reside within. Great performances by the whole cast especially James McAvoy. If you have not watched ‘Unbreakable’ and ‘Split’ you will not be able to follow the story, as they did not do a good job of introducing the characters to new viewers. The pacing of the movie is too low at times. Elijah Price: First name, Mister. Last name, Glass. Dr. Ellie Staple: I don’t think we are particularly evil, and we don’t choose sides. We try to stop both of you. If there is one of you, the opposite of you appears; it escalates, we step in. There just can’t be gods amongst us. Glass is the conclusion of a super hero movie trilogy. The main problem with this trilogy is the sheer amount of time between movies. 16 years between the first and second film, 3 year between the second and third film. This makes it hard to follow at times as you will be required to remember what happened in the previous films. 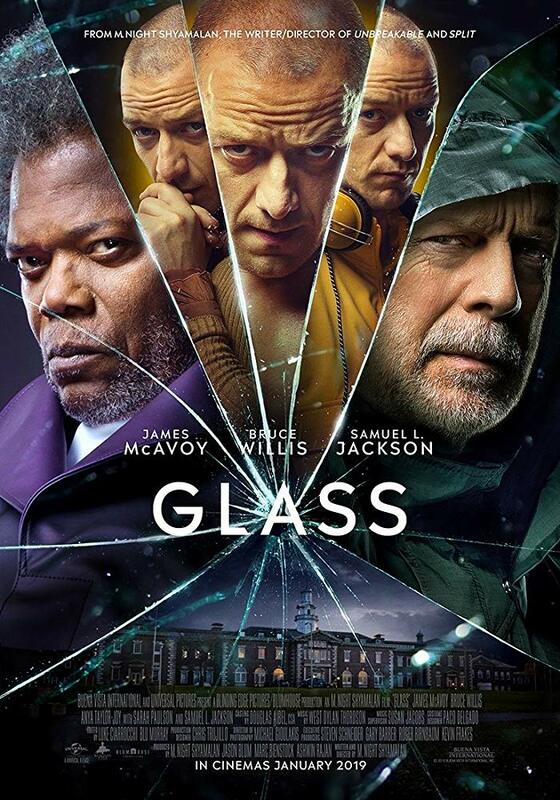 In an era filled with Marvel and DC super movies, Glass is rather refreshing in its non traditional approach. Glass has a down-to-earth believable, gripping story line. James McAvoy, who played the character of Kevin Wendell Crumb, was the star of the show. His portrayal of the different personalities of Crumb was simply amazing. Unfortunately Glass concludes Shyamalan’s superhero movie trilogy in a manner that manages to be absorbing, frustrating, and bewildering at the same time.